Reputation making humorous magical effects, which are clever as well as comical. "The introduction was unnecessary, we've met before ... though I must confess that this book is quite different from anything I've written in the past. 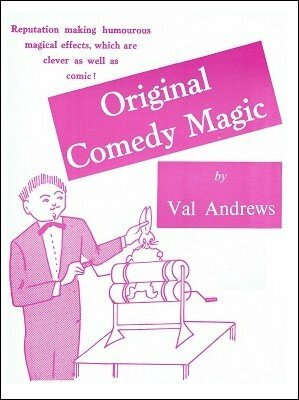 In these pages you will find original effects which lend themselves well to COMEDY presentation ... though the effects are not burlesque, and the mystery angle is definitely there! In addition to these effects, you will find routines, magical sketches, and complete acts. Not bad value for whatever the publisher decides to charge. How much? Oh ... well, I still say you weren't robbed! VAL ANDREWS"
"Pump-Up Dove Or Rabbit". A comedy effect with livestock which is mystifying as well as funny. "All The Fun Of The (Un) Fair". Or "Give That Boy A Kewpie-Doll." A startling balloon to doll effect. "Wring Out A Rabbit". Just to prove that this book is not for squeamish readers. "Incredible Juggling Feat". But performed with the hands! "Penetrating-Stick-Knob". Not a romantic title, but that's what it does. "From Square To Beat-Nik". From Gentleman to Teddy-Boy with one pull of the thread! "Posthumous Silk Trick". A comedy presentation. "Quickie". A magical revue snapshot. "Just Wait Until I Get You Home". An original double act for Magi and Missus, or Conjurer and Comedienne. "Whatever Happened To Emma". Magical revue sketch. 1st digital edition 2015, 16 pages.